Eyes on the meadows, all covered in snow, originally uploaded by The Bacher Family. Greg Carstens is one of our dedicated volunteers at Mount Rainier National Park. I took this picture of him at the annual Meadow Rover training, which, clearly, took place in 2008 before the meadows had melted out from the snow! 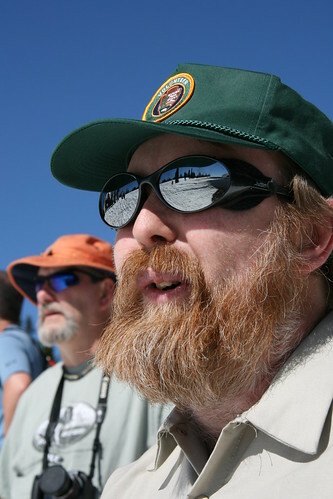 I love the grizzled beard, perfect reflection, prominent volunteer patch, and perfect depth of field in this shot -- not to mention that gorgeous blue sky. Guest Photo of the Day: me. Guest Photo of the Day: Do Stars Feel Blue ?